KZYEE KM10 Auto Circuit Tester is an Auto Electrical System Testing. Kzyee KM10 Power Circuit Probe Kit is 12V 24V Volt AVOmeter. it can display all the test result, save your time on diagnose car electrical problems. 1. 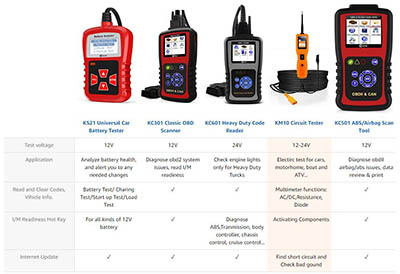 ONE TESTER FOR ALL CIRCULT TESTING-- KZYEE KM10 power scan kit is the most revolutionary circuit tester, which performs each type of service, including power injection and measurement, ground testing, polarity checking, continuity testing and components activating etc. 2. 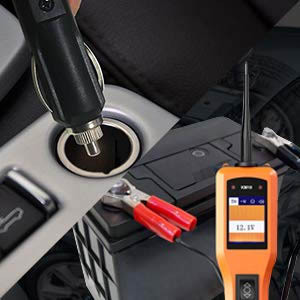 DO ALL THE MULTIMETERS DO, AND MORE -- With this automotive voltage tester, you will be able to accurately diagnose the DC Voltage, AC Voltage, Resistance and Diode of the 12v-24v electrical systems by simply pressing the mode button. 3. COMPONENTS ACTIVATING-- Our auto probe tester is capable to power up the components, such as cooling fans, starters, relays, windows, washers and so on. Powered by the car battery or cigarette lighter, no additional battery or wires pulling needed. 4. 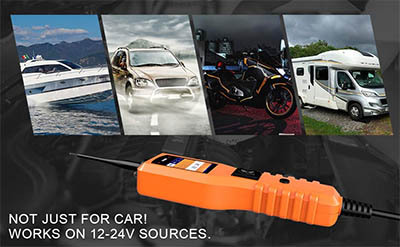 WORTH TO OWN-- The electrical system diagnostics tool provides 20ft extension cable for you to reach all around your vehicles, trucks and trailers (12V-24V). And the built-in flashlight is bright enough to light up your work area. 5. 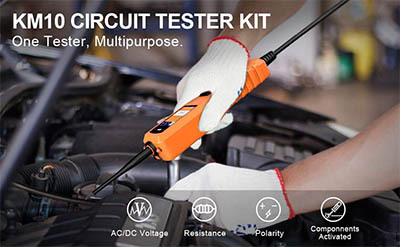 KM10 short circuit tester has the ability to tests for bad ground contacts instantly, tracking and locating shorts fast without losing fuses. What’s more, it is circuit breaker protected, which is a safer measure to protect the tool from overload. 7. LCD Screen Display, Easy to Read Indicated Test Results: A large color LCD screen, can display all the test result, save your time on diagnose car electrical problems. 8. Head Lights & Audio Tone, Make It Possible to Work in the Dark: Built-in front LED flashlights, allow to work in the dark environment. Audio tone indicator, no-look menu scrolling once users are familiar with menu tone assignment. 9. Circuit Breaker Protection Technology: Ability to power up components. Automatically shut-off if current exceeds 5 Amperes, it design to protect an electrical circuit from damage caused by over current, typically resulting from an overload or short circuit. Activating Components in Your Hand and in the vehicle.With a flip of the power switch, you have a hot instant / grounding for voltage & polarity testing.Powering up components such as windows, lights, starters, wipers, and so on. Simultaneously uses the hot lead and the ground wire to activate elements right in your hand. Frequency response of tone pass through 0Hz to 10Khz. Testing Standard:100% current: Hold > 1 hour150% current: trip in one hour200% current: trip in 3-30 seconds.300% current: trip in 0.5-4.0 seconds. Does More Than a Multimeter.Simply choose the diagnose mode by pressing the mode button, and then contact the probe tip to a circuit, the LCD display will read the DC/AV voltage, resistance. Short Circuit Finder, Bad Ground Checker KM10 follows and locates open or short circuit without having to move panels, molding or carpet to expose wires. No more fuses wasting. No Extra Battery Needed 2 power recources. Simply connect the KM10 with the cigarette lighter or battery electrode, then you are ready to go.